(by Eric Bellman, WSJ.com) – Even amid the global economic slowdown, one Indian industry continues to boom: selling cellphones to the rural poor. Economists have slashed Indian economic growth forecasts for this year and the stock market is in the doldrums. But cellphone companies are signing millions of new subscribers a month, making India the fastest growing mobile-phone market in the world. There is no sign of a slowdown yet: figures to be released later this month are expected to show that new subscriptions in January reached a record 11 million. The demand for cellphones is coming mainly from rural consumers, who typically earn less than $1,000 a year. These buyers haven’t been affected by plunging stock and real-estate prices or tighter bank lending since they typically don’t own land and don’t borrow. A large majority of them don’t have access to regular landline phone networks — there are only about 40 million landline subscribers in India — so once cellular coverage comes to their towns or villages they scramble to get their first phones. In the village of Karanehalli, a cluster of simple homes around an intersection of two dirt roads about 40 miles from India’s high-tech capital of Bangalore, Farmer K.T. Srinivasa doesn’t have a toilet for his home or a tractor for his field. But when a red and white cellular tower sprouted in his village, he splurged on a cellphone. While the way his family threshes rice — crushing it with a massive stone roller — hasn’t changed for generations, his phone has changed the way he farms. He uses it to decide when to plant and harvest by calling other farmers, to get the best prices for his rice, coconuts and jasmine by calling wholesalers, and to save hours of time waiting on the road for deliveries and pickups that rarely come on time. Mr. Srinivasa, like close to half the 800 people in his village, uses Idea Cellular Ltd. as it was the first to bring them service. He paid the equivalent of about $60 for his Nokia phone, and spends about $6 each month for service. Like most rural users, Mr. Srinivasa uses his phone to make voice calls — he doesn’t know how to text message or to download emails. On average rural Indians use their phones around 8.5 hours a month, up 10% over the past year. The story is the same across rural India, home to more than 60% of India’s population of 1.2 billion. China, Indonesia and Brazil also continue to show solid growth in cellphone sales. The continued expansion of the cellphone industry in India stands in sharp contrast to most other industries here. Textile and software exporters are struggling. India’s brand new malls are sparsely populated and the sales of cars, trucks, tractors and motorcycles have declined in recent months. But the cellphone industry recorded more than 10 million new subscribers in December, up from eight million a year earlier. The industry’s overall subscriber base grew 48% in 2008 to 347 million customers. Rural customers “have been hungry for mobile phones for a long time, so demand will remain unaffected,” by the global jitters, said S.P. Shukla, chief executive officer of the mobile business at Reliance Communications India Ltd., India’s second-largest cellular company by number of subscribers, after Bharti Airtel. Reliance launched a new $2 billion nationwide network in January that reaches more than 24,000 towns and 600,000 villages. International wireless giants are clamoring for a piece of the action. Last year, Vodafone Holdings PLC took over India’s fourth-largest cellular company by number of subscribers. In December, Japan’s NTT Docomo Inc. announced it will pay almost $3 billion for a 26% stake in Tata Teleservices Ltd. While the average amount subscribers spend has slipped as less-affluent consumers get connected, profit growth and margins have remained healthy thanks to economies of scale, according to investors and telecom executives. For example, Bharti Airtel saw its profit in the three months ended Dec. 31 climb to 22 billion rupees ($452 million), up 25% from a year earlier, as it drew in a record number of new subscribers. And with a national penetration rate of less than 30% as of December there is still a lot of untapped demand. In contrast, in the U.S. more than 80% of the people have mobile phones. In China the penetration rate is more than 40%. In Khairat, a village 45 miles outside Mumbai that is only accessible on foot or by motorcycle, buffalo farmer Mohan Zore makes around $80 a month but figured he still needed a phone once his village got coverage. He doesn’t have to walk into the market to find out the price of buffalo milk, he now just dials friends at the market from his phone. And he can easily call his son from the fields when he is out grazing his herd. He used to spend 300 rupees and three hours on a bus to visit his daughter and grandchildren. Now he can catch up with them for one rupee a minute. “The phone saves me money,” he says from his mud-walled home, which he shares with his 20 buffalo. Mr. Zore can afford a phone because Indian cellular services are among the least expensive in the world. Incoming calls are free and making a call usually costs less than 2 cents a minute. Most of the rural subscribers use prepaid cards for service rather than monthly plans, topping up as needed. The companies are pushing ahead with multibillion dollar build-out plans to expand their networks to smaller and smaller villages. “We are still experiencing strong growth in all areas,” said Amit Ganani, chief executive officer for Tower Vision India Pvt. Ltd., a New Delhi based company that builds cellular towers and then rents them out to multiple service providers. It built the tower that brought cellular services to Karanehalli. It plans to raise the number of sites it has in India to about 5,000 by the end of the year from about 3,000 now. “If you go to the remote areas you don’t have to be a genius to record huge growth,” Mr. Ganani said. The villagers in Karanehalli say the cellular tower was one of their first opportunities to plug into what was happening in the rest of India, and the world. They can name America’s new president — “Obama!” a group of villagers shout when asked. They know that the global slowdown has hurt the price of coconuts as well as silk. 1. a) What is the population of India? b) What percent of the population live in rural areas? 2. a) How many land lines are there in India? b) What percent of the population owns a land line? 3. Describe the three ways K.T. 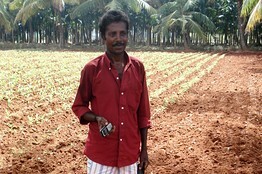 Srinivasa uses his cellphone for farming. 4. How much time do rural Indians spend on their cellphones per month? 5. Contrast the number/percentage of people who have mobile phones in India with the percentage of those in the U.S. and China. 6. a) How does buffalo farmer Mohan Zore save money with his new cellphone? b) Mr. Zore makes approximately $80 per month. How can he afford a cellphone? 7. What comments, questions or observations do you have about this article? View additional photos from the article here. For background information on India, go to the CIA World FactBook website.